My first trip to Italy was on a Rick Steves tour called the “Best of Italy in 17 Days.” Tour participants flew into Milan, then traveled individually by train to meet the tour guide and others in the group in the exquisite small town of Varenna on the shores of Lake Como. Anyway – as you can imagine, spending seventeen days going from one spectacular sight to the next is a whole lot of wonderful on top of wonderful. The wise people at Rick Steves Tours (maybe Rick, his very own self?) realized that even the most intrepid traveler might start exhibiting signs of Bella Italia Overload about midway through the trip, so they scheduled a “vacation from your vacation” in the calm and breathtakingly lovely Cinque Terre. If you were approaching by helicopter from the west, you’d see the Cinque Terre as five tiny villages, a little like adorable pastel Lego towns, clinging to a stretch of steep, rocky hills plunging into the blue and white Mediterranean Sea. Hikers from around the world lace up their boots and grab big sticks to stride from one village to the next, enjoying unforgettable views of vineyards, olive trees, the tiny towns and the magnificent ocean below. It is truly lump-in-your-throat beautiful. How would you like to see this from your hotel window? I know! Now, if you don’t “hike,” there really isn’t a whole lot to do in the Cinque Terre. And that was absolutely fine with me. I wore the last clean outfit in my suitcase and happily sent the rest of my clothes out to be laundered. I have no idea why I thought it would be a good idea to waste an inch of space on that last pair of pants because they were scratchy quasi-sweatpants that chafed – not the most pleasant choice for October in Italy, which can be surprisingly hot (word to the wise). Then we took a ferry back to Monterosso and set out to explore the Old Town (the new town, by the way, was on the other side of a tunnel running beneath the train tracks and that’s where larger hotels and the area’s only significant beach are located). There wasn’t much in the way of shopping, unless you’re into inflatable floaties and generic beach towels, but we did find one very cool shop called Fabrica d’Arte. My friend Carol bought a small handmade terra cotta wall plaque and as I write this, I have to say I wish I’d gotten one for myself. Halfway through the trip, I had already bought so much stuff, I finally had to face the fact that future travel would be far less frequent if I had to budget as much for “souvenirs” as for an airline ticket. Now I collect bookmarks. A little further along, we came across Monterosso’s pretty church, San Giovanni Battista. I do love the dramatic black and white stripes typical of the Romanesque style, so we checked that out for a while, even though we had already seen more churches in the prior nine or ten days than I’d visited in a decade. As we were leaving, a seemingly deserted and definitely dilapidated church almost crouching next door caught my eye. The church looked abandoned, and yet the door was wide open, so we decided to peek into the gloom. And there we found . . . 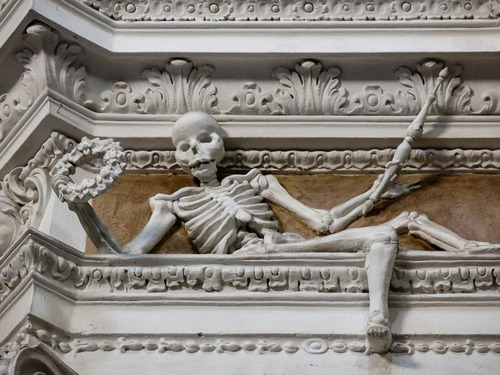 The Church of the Skeletons! Oh my goodness! This charitable group raised funds to support the widows and orphans of men lost at sea and the “black” was in reference to the clothing worn for their religious processions. The chapel dates back to the 16th century when many of the village men made their living fishing, and also would have been called upon to defend Monterosso from the pirates who rather frequently attacked the comfortable villages on this coast. 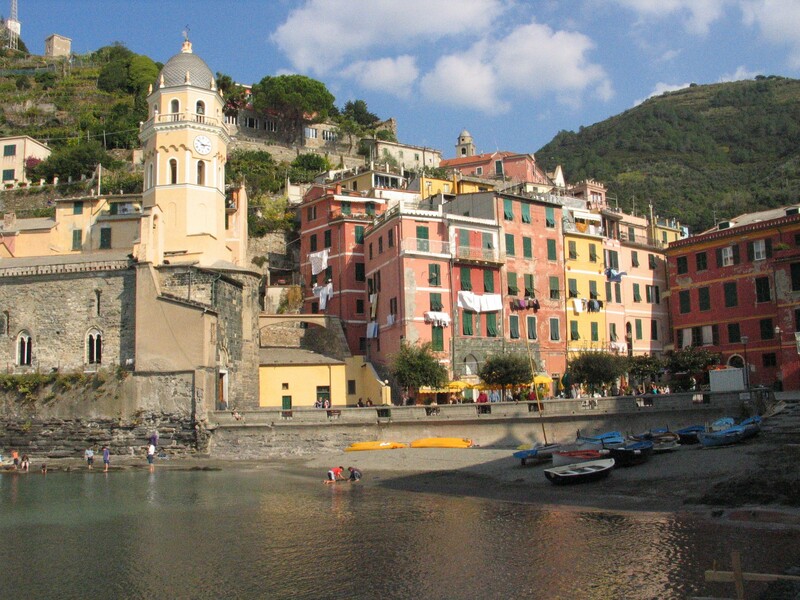 In fact, pirates had been pestering these folks practically since Monterosso was established in the mid seventh century. Mamma mia! So, what else can you do on your vacation in Monterosso? Well, the food is great. There’s plenty of fresh seafood and the lady who owns and runs Hotel Pasquale even demonstrated how to make pesto, most authentic to this region of Italy. You could work on your tan on the beach over in the New Town. Or if you’re young – or young at heart – or silly and in the mood – you might want to join American students for a few drinks at Fast Bar, not far from the main piazza. Fast Bar has loud music, televisions that play American sports (on the rare occasions when the timing works out) and the walls are papered with US one dollar bills autographed and posted by those who visit. Since students are the primary clientele, you might see bills signed by Jennifer, Hook ‘em Horns! or Brad from NYU! I think I signed mine as Kate, Rustbelt Girl! Something like that. Maybe someone will think it’s from a coed at Cleveland State instead of that little hottie’s granny. Anyhoo. 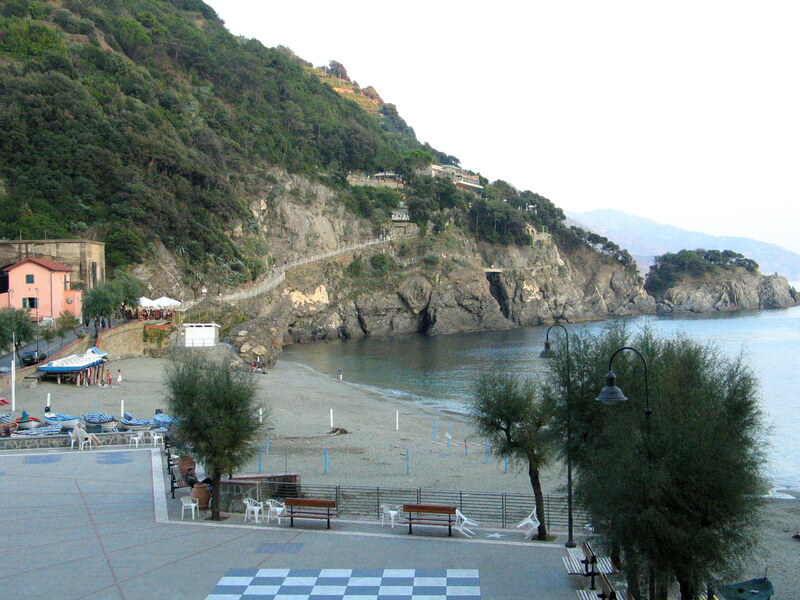 If you have time in the lovely Cinque Terre, stop by to say hi to the skeletons in Monterosso. Tell them the Rustbelt Girl sent you. Ciao! This entry was posted in Travel and tagged Best of Italy in 17 Days, Cinque Terre, Confraternita dei Neri, Fast Bar, Hotel Pasquale, Italy, Lake Como, Monterosso, pesto, pirates, Rick Steves tours, Romanesque, San Giovanni Battista, skeletons, skulls, Vernazza. Bookmark the permalink. I love your voice and visuals — feels like I am there.